I should mention that writer/director GLEN L. WOLFE was not available, but he’s given Dan the green light to discuss the project in this interview. JONATHAN: So, Dan, how did Glen come up with the idea to do a fan film focusing on Dawson Walking Bear? The idea came together over that weekend, and Glen wrote the initial first draft to that story the following week. 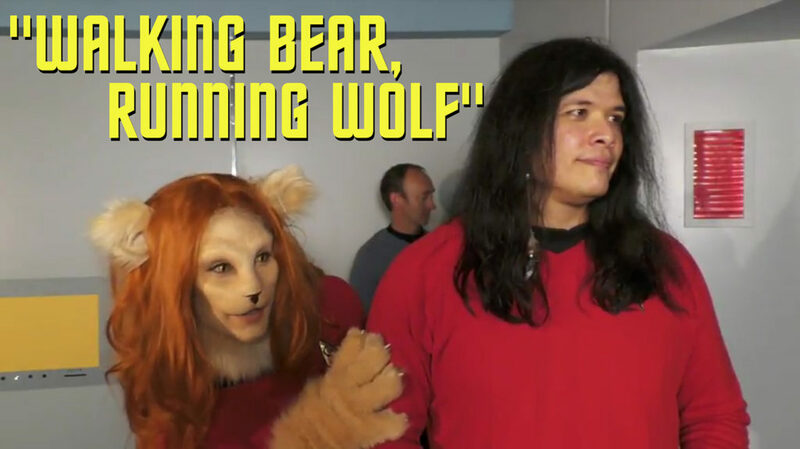 The script initially called for “Running Wolf” to be played as Walking Bear’s father. But finding the right male to play the role was difficult. Dana O’Quin, who is half-Cherokee and has been a long time stage actor living in Harrison, AR (where the story was shot) was a great alternative and I feel actually increased the story’s worth. JONATHAN: Speaking of casting, you ended up using the same actor who had played Walking Bear in Star Trek: New Voyages. Did you always intend to use him for the role? DAN: Glen and I worked on two films at Star Trek: New Voyages when Wayne W. Johnson played Ensign Dawson Walking Bear. So it was a natural fit to ask Wayne if he’d like to reprise his role. And moving Walking Bear up to Lieutenant seemed to be a nice touch for those followers. JONATHAN: Yeah, I noticed the promotion. Nice touch. DAN: One thing about Glen and his attention to detail with the stories he writes for The Federation Files is that he obsesses about doing so much more than donning a Starfleet uniform and shooting phasers. He wants to add to these TOS-era episodes, produce something that can be pulled off of a shelf many years after we’re gone for people to watch and enjoy. 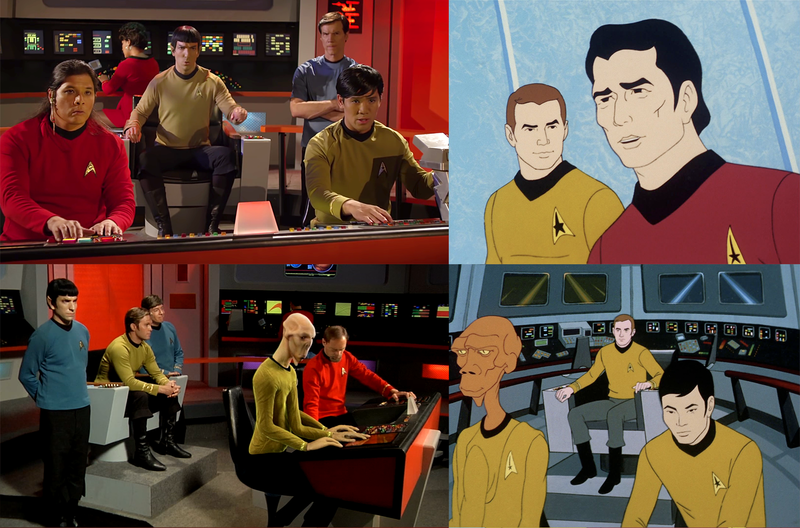 JONATHAN: It was interesting seeing an episode of a TOS-era fan film based on the USS Enterprise that did NOT focus on main characters. 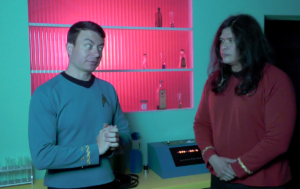 Series like Star Trek Continues and New Voyages always feature Kirk, Spock, McCoy, Scotty, and the rest. You had McCoy and a brief cameo by Spock, but no Kirk anywhere in sight! DAN: The decision to not use Captain Kirk was tricky. But I feel that, by not showing Kirk in any capacity, it reveals the feel of the “2nd shift” that is obviously apparent on a Constitution-class starship. You even see the shift change as the 2nd shift doctor, played by Coy Turner, relieves Dr. McCoy, played by Frank Jenks. Also, having no main TOS characters to go on an away mission allows the plot and story to better focus on the star of this episode: Walking Bear. 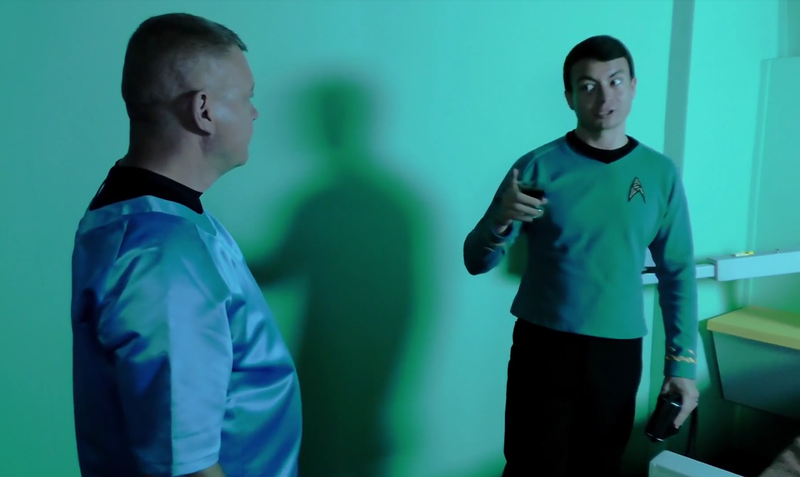 DAN: There were sets that needed to be built for this episode, and Glen and I helped finance the corridors, the rec/briefing room, Walking Bear’s crew quarters, and the reassembling of the transporter room. JONATHAN: The new stuff looks spectacular. How long did the entire episode take to film? DAN: We started the shoot on Saturday, May 13th. That shoot day ended around 2am! The following day started around 9am where all cave scenes were shot and then moved over to my personal property where we shot exteriors of the cave entrance. We ended the film shooting Commander Maren’s (Allyson Marx) close-ups around noon. JONATHAN: All of that in just two days??? Actually, about a day and a half…VERY impressive! JONATHAN: Most productions filmed at Starbase Studios make copious use of that amazing bridge set. But you have only one very short scene there. Was that a conscious decision not to shoot much on the bridge because you wanted to stand out from the rest…or was it simply that the script didn’t call for bridge scenes? DAN: The script, the way it was written, didn’t need any bridge scenes, per se, as the focus of this episode was about Walking Bear, who didn’t have a shift on the bridge, and focused more on his personal experience as a crew member of the Enterprise. 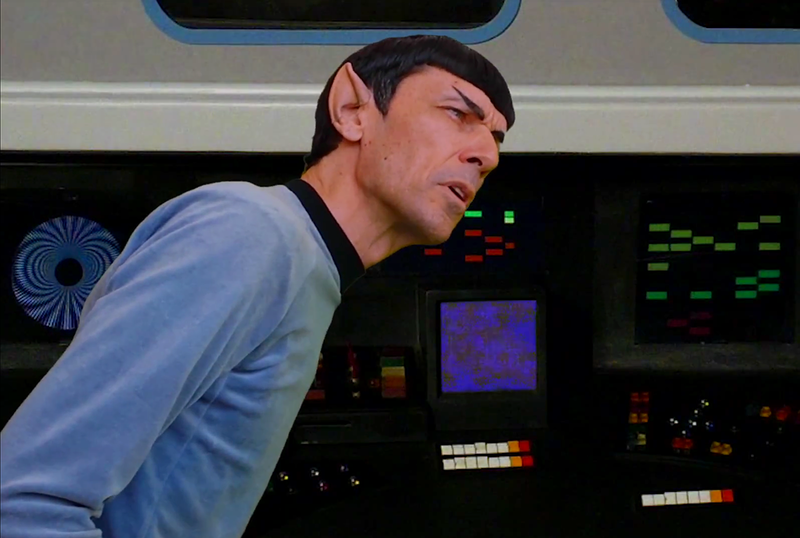 JONATHAN: Speaking of the bridge, I noticed that Paul Forest (an amazing Spock doppelganger who appears at many conventions) was shot in front of a green screen with a bridge background digitally composited behind him. Was he not able to make it down to Arkansas? If not, where was he filmed? DAN: Paul’s phenomenal appearance with his one line “Negative” was an Easter egg in allowing us to make the Enterprise and the original crew somewhat of a real presence throughout this episode. Paul did his cameo just days before we were to release “Walking Bear, Running Wolf,” and I had to hustle to include him into the scene with M’Ress and render yet another final version of the film. He did this, I’m told, during the Vegas Star Trek Con. JONATHAN: Another TOS “doppelganger” is one of my favorite people, Frank Jenks, who played McCoy in your fan film after previously appearing in the second episode of Starship Valiant “Crosses to Bear” last December. DAN: Frank was another great addition to the story. Glen’s approach to writing involves who is available and how he can get them. We were so lucky to have everyone we wanted to be available. Wayne has worked in many films and is a true professional, and Frank is the most patient individual on the planet. His scenes were to be shot in late afternoon, but we didn’t get to him until after 1am! JONATHAN: Many fan films shoot quickly and then spend a lot of time in post production. For you, it seems like post production went pretty quickly and still came out pretty high quality. How did you manage to complete your film so fast? DAN: Glen had the episode”His Name is Mudd” literally dormant on the shelf because of stalled post production. He was worried that he wouldn’t reach his premiere date of the 50 year anniversary of “Mudd’s Women”…which aired October 13th, 1966. I asked if he needed help. He sent me raw scene footage and, because of my background producing TV commercials, it was not a big stretch to crank out scene after scene for him. 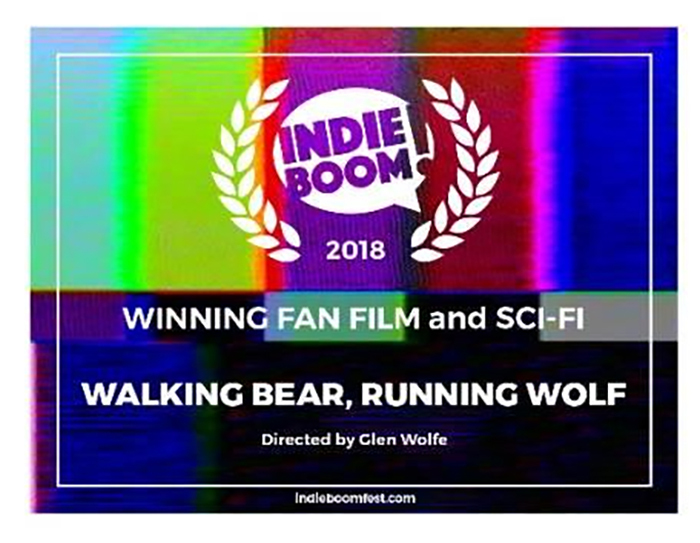 So after being able to direct the photography, block the actors, select filming locations, and supervise many other aspects of the production process, posting “Walking Bear, Running Wolf” was a shear dream working in the editing suite. 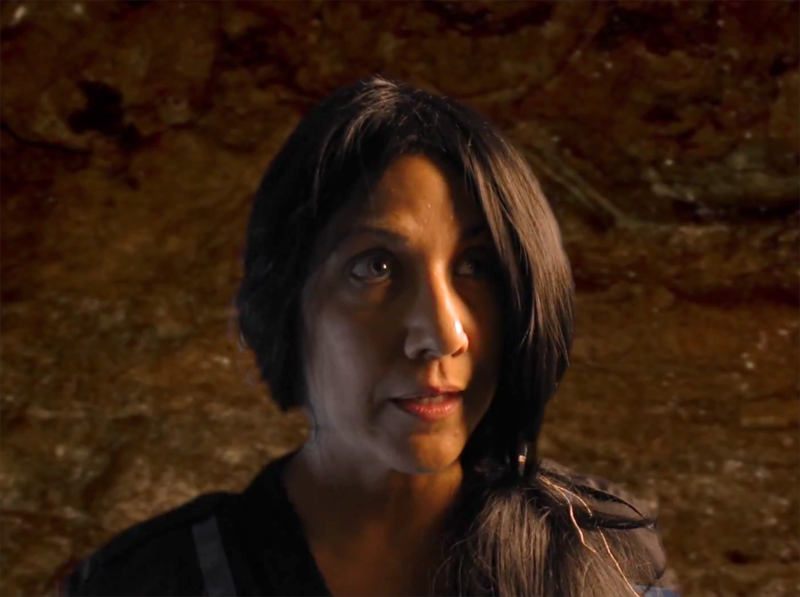 The initial post was a little over 4 weeks And then I simply had to wait on a few final elements like pickup shots and closeups of Dana in the cave, Paul with his “Negative” line, and additional orchestration from Emmy® Award Winning composer Kevin Croxton adding the musical moods for the wolf (Dia) and the final closing credits. JONATHAN: The first episode in The Federation Files series, “His Name Is Mudd,” debuted last October. How many more episodes are planned, and when is the next one scheduled to be released (assuming one is coming)? DAN: When Glen and I finished “Mudd,” we both wanted to know what yearly schedule we wanted heap upon ourselves. Glen expressed a desire to shoot four stories with a minimum of two per year, and I wanted to do six. Because all of the sets that were housed in the old Starbase facility in Oklahoma City location had to be moved to Arkansas, our shooting schedule has been skewed quite a bit. We will complete another episode that has some bridge scenes already shot that were accomplished during Michael L. King’s shoot of Valiant‘s next episode, “Animals,” when he and his crew were here. Our new episode, “Extraction,” will officially be episode #3 of The Federation Files—only because my story “Doppleganger” has hit snags in pre-production…like finding the right male actor for the captain role and making sure we have enough extras to complete the project. The mission is to follow the CBS guidelines by telling stories in that framework. The Federation Files series does that perfectly by having a new cast, different characters, different ships, shuttles, cargo vessels, planets, aliens, new life forms, etc. each episode. “Extraction” will be a 15-minute episode, and the shooting schedule will happen in September on another studio premises that is accommodating a Federation TOS style shuttlecraft and a Romulan shuttlecraft, which has never been seen in the TOS world. It has been designed by our go-to space visual effects guy, Samuel Cockings. 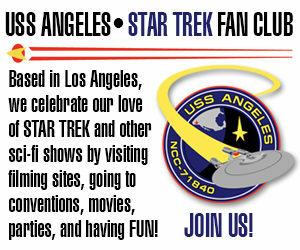 JONATHAN: Your first Federation Files episode featured the USS Constitution NCC-1700. Your second episode dealt with the USS Enterprise NCC-1701. Will your next episode feature NCC-1702 (which, according to the Franz Joseph STAR TREK Technical Manual is the USS Farragut, which doesn’t match the NCC-1647 that was used in the Starahip Farragut fan series …so that could get messy)? DAN: This next episode, “Extraction,” will be commanded by Captain Randall. And as of today, and because the website Memory-Alpha doesn’t list a Captain Randall, it’s up in the air what starship he will be piloting. The story however is not a starship episode in that it is about a shuttle rescue. JONATHAN: And finally, so far, you folks haven’t held any crowd-funding campaigns. Will that change, or are you able to continue self-funding your fan series? DAN: Getting past “Mudd,” and now that “WB, RW” is under or belts, Glen and I both feel, because of the tainted fan film funding waters, that we should basically fund everything we can ourselves. That being said, it most certainly will limit us in many resources to bring in actors and pay for many expenses incurred making these films. Hopefully, our stories and production quality will attract a core of followers to at least get our view numbers to a level that tells us that we are doing the right thing. Glen is a prolific writer, and if anyone has seen him work on-set, they will tell you that they are amazed at how he wrangles the cast and crew…an almost magical way to get things accomplished. My forte is post. Completing “Mudd” and being immersed in the fan film world taught me that so many fan film projects die, not because of a great story idea or the equipment used on a good production crew or the actors, but from the ability to get the project completed. I can name no less than five fan films that have been shot that are still awaiting to be finished…some that were crowd-funded. We don’t want to start any project unless we know full well that it will have a release date. Glen and I both are not driven by being in front of the camera and are like two kids with all of our favorite toys when we are on set directing the action in one way or another. So our focus is to create a film that not only we will be proud of but one that our fans will love to watch. Next Next post: NEW TRAILER from the AVALON UNIVERSE!